Over the last week I have had the chance to experience some fantastic opportunities. 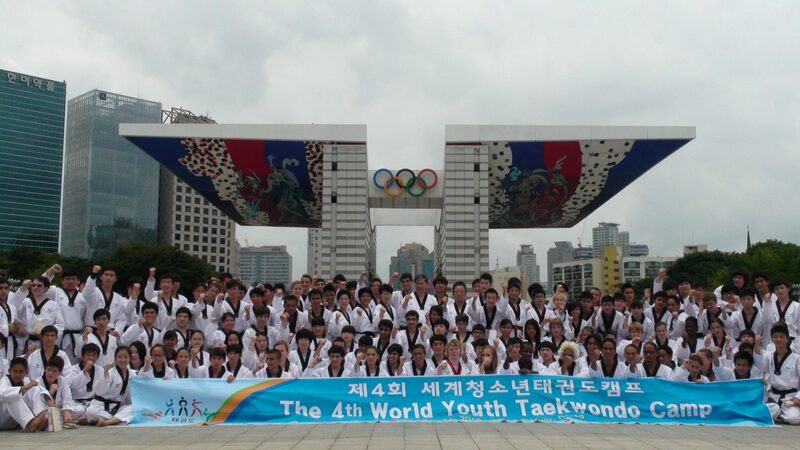 I was invited back to South Korea to speak at the 4th World Youth Taekwondo Camp. There were approximately 300 people from 30 different countries at the camp. Through out the week I was approached by many youth who had seen my story on television and were inspired. I was part of a special lecture series and had the chance to inspire youth. I had several encounters with the local media far more than I ever expected. 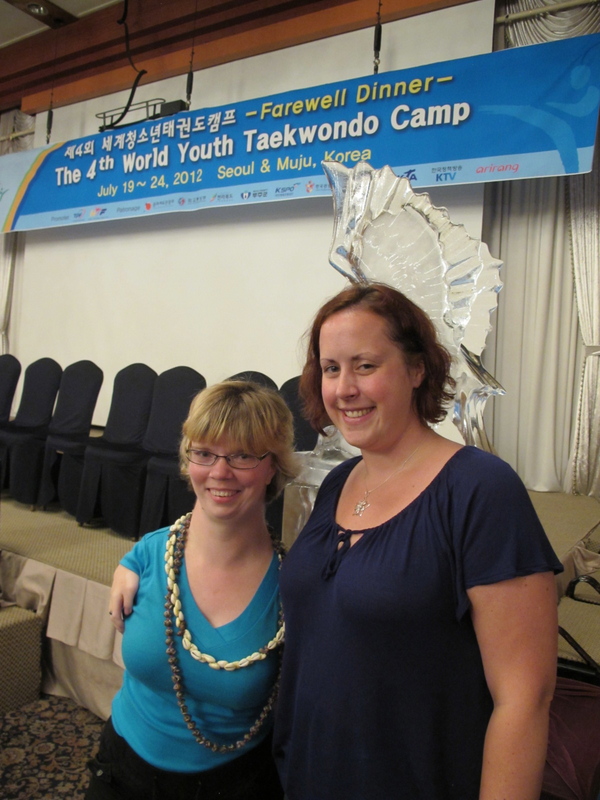 I made friendships with Olympic medalists and trained with Taekwondo Masters from all over. I was also was reminded of my own limitations despite my determination to succeed. Our, myself and Danielle, travel to the camp was long as we had a 14 hour air flight to Korea and then a three-hour bus ride to our hotel in Muju, South Korea. Upon arrival we went straight to sleep for we had a full day training the next day. The arrangements that we had in Muju were beautiful the view of the mountains from the room was amazing. Since we got in so late, breakfast was our first true opportunity to meet the other participates. We meet a mother and son from Jordan and got to hear her son’s journey to the camp which was not the easiest. I also found out that my story had made a difference in his life. Before we knew it we had arrived at the training facility and gathered together to train. Throughout the day I had the opportunity to train with the participates. At times I joined the students and trained within the group this was enjoyable and at other times I assisted with the instruction of the students. We did a stretch and kicking drilling (Kyorugi) together. During the first training day I meet an olympic medalist, Tran Hieu Ngan the silver medalist at the 2000 Sydney Olympic games, she was extremely friendly and we hung out the rest of the week. I was also asked to speak with the press. This was quite the experience as I sat in a room with about ten reporters it was like I was having my own press conference. I was in awe about how my story had impacted so many people all over the world. The following day we had the special lecture series and had the chance to experience Korean Traditional Culture. Through the special lecture series I was given the chance to speak to the participates about my story. I was also able to inspire hope and enthusiasm in the youth. As speaker I always try to inspire my audience in finding their inner strength. I spoke about how we all have our own challenges and with those we are all here today. Taekwondo is a sport that gives opportunity to the many and what we learn in Taekwondo we can then take and apply to all the parts of our lives. It really was an honor to speak at the camp. I feel that I made a difference in the lives of these youth. I hope the media coverage that occurred during my visit helps to inspire and reach many more in South Korea and all over the world. After the lecture series we were given the chance to experience Korean traditional culture. We went to the cultural center and had a traditional meal. 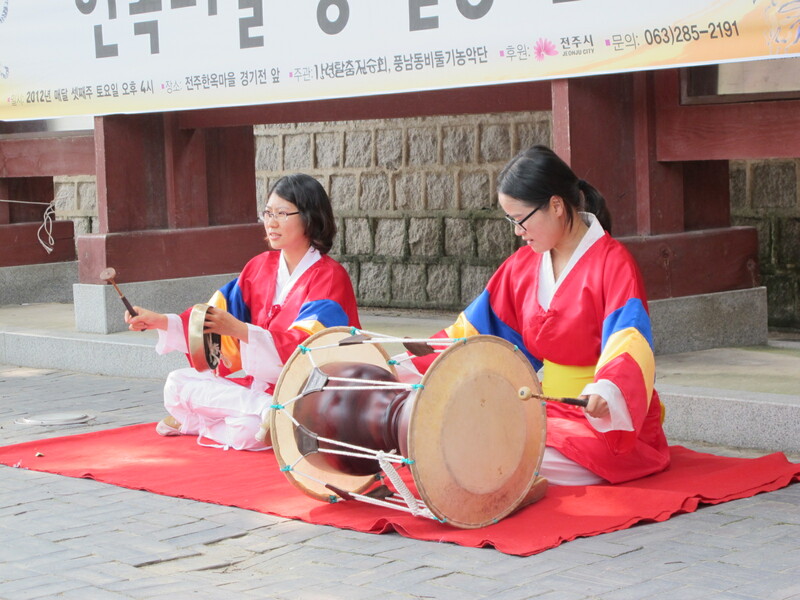 We also had a chance to learn about a traditional wedding and Korean drums. We also had a chance to visit a traditional village called Jeonju Hanok. I really enjoyed seeing this cultural side of South Korea. As we were leaving the village there was a presentation of the lion mask dance. This was great to watch as it included the drumming we were shown at the cultural center. The following day we returned to our training. In the morning there was Kyorugi training again and I took this time rest as we have had a busy schedule. In the afternoon we had Poomsae (Forms) training during this time I did a demonstration of a Poomsae to the group and joined the instruction. 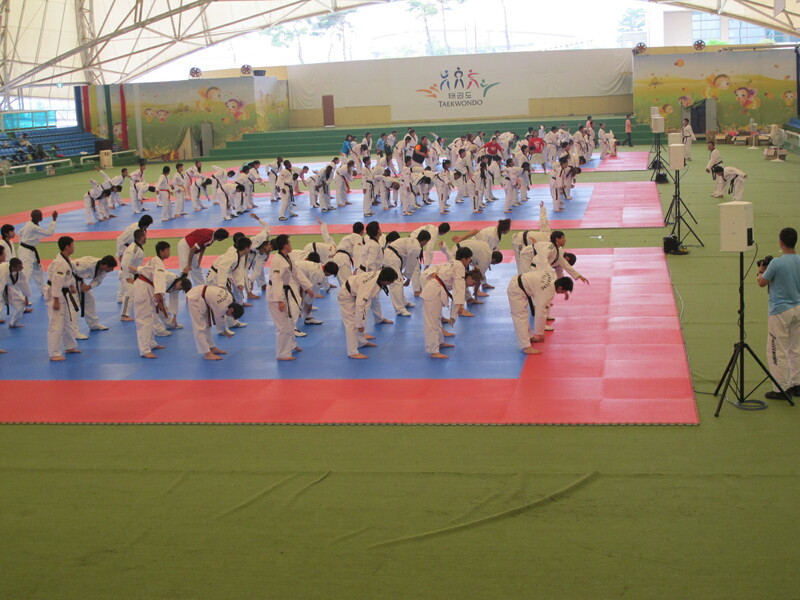 I really enjoyed the Poomsae part of the training. Unfortunately, at the end of the Poomsae my knee gave out on me. This stopped me from being involved with the Kyukpa (breaking). We also took a trip to the construction site of Taekwondowon and it was amazing to the models and picture come alive. In the evening our day of culture continued as we had a K-POP dance performance. Then the youth presented folk costumes and had a talent show from their native country. At the end we the demonstration of the flying pungdeung where we wrote our hopes and dreams and let them fly in the sky. On our last full day we packed everything up and moved ourselves to Seoul. 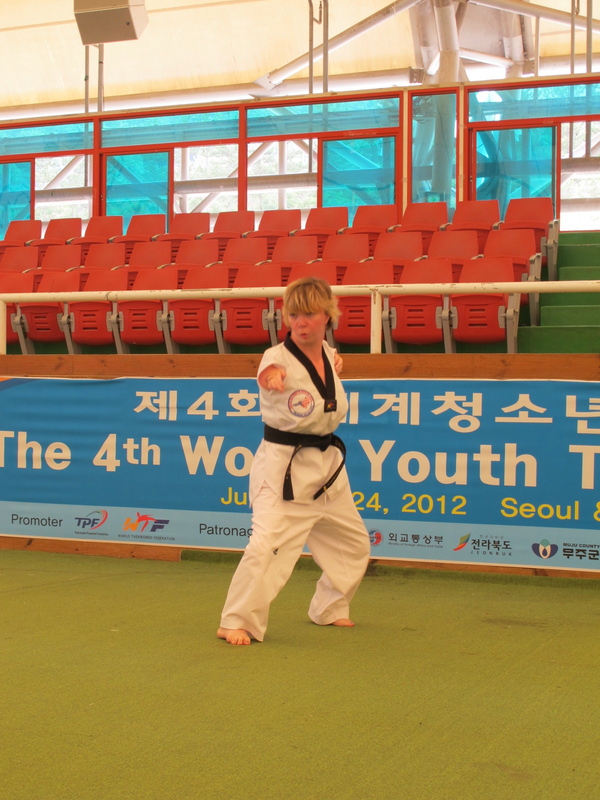 We were on our way to do a Poomsae and Kyukpa demonstration at the Olympic Park. When we arrived they gave me a new dobok with the sleeves removed. We did a short practice and then were given a break. Things were going well and then my knee gave out and I had lots of pain. It was so bad that I couldn’t bend my knee and barely walk. My friend Danielle was there for me and helped advocate for me. I had managed to do everything else was doing without problem but my body had hit its limit. However, within a few minutes a Mater from Spain was by my side and was massaging and using pressure to help my knee. I was given ice and told to sit. Within five minutes I was standing without pain and was able to join the demonstration of the Poomse. I was glad to be about to join the demonstration. However the knee pain did return and I had to rest at the hotel for the rest of the afternoon. It was not a decision that I like , but it was a needed and responsible one. Growing up with a disability I have learned the importance of having support and knowing when to stop. On this trip I had different support people but one stand out my friend Danielle. Danielle was there as a companion and gave so much support without question. She carry things for me so I would last longer and helped me with the smaller things that happen throughout the trip. It was her support that made a difference to me. We ended the week with a final dinner. During this time I had the chance to talk with the youth from all the different countries. I found out that my story has been published in a magazine called I Love Taekwondo Global Magazine. I had an amazing time on my second trip to South Korea and I look forward to a chance to return again.